Background: Acne vulgaris is the most common disease of the skin affecting adolescents and young adults causing psychological distress. The combination of antibiotic resistance, adverse effects of topical and systemic anti acne medications and desire for high tech approaches have all led to new enthusiasm for light based acne treatment. Intense pulse light (IPL) therapy has three modes of action in acne vulgaris i.e., photochemical, photo thermal and photo immunological. Aims: (1) to study efficacy of IPL therapy in facial acne vulgaris. (2) To compare two fluences - one normal and other subnormal on right and left side of face respectively. Methods: (Including settings and design and statistical analysis used). Total 45 patients in age group 16 to 28 years with inflammatory facial acne vulgaris were included in prospective study. Baseline data for each patient was recorded. All patients were given 4 sittings of IPL at 2 weeks interval and were followed for 2 months every 2 weeks. Fluence used was 35J/cm2 on right and 20J/cm2 on left side. Percentage reduction in lesion count was calculated at each sitting and follow up and graded as mild (0-25%), moderate (26-50%), good (51-75%) and excellent (76-100%). Side effects were noted. The results were analysed using Mann-Whitney Test. Results: On right side, excellent results were achieved in 10(22%), good in 22(49%) and moderate in 13(29%) patients. On left side excellent were results achieved in 7(15%), good in 19(42%) and moderate in 16(43%) patients. There was no statically significant difference noted in efficacy of two fluences used in treatment of facial acne vulgaris. Conclusions: IPL is a effective and safe option for inflammatory acne vulgaris with minimal reversible side effects. Subnormal fluence is as effective as normal fluence in Indian skin. Intense pulse light is effective in the treatment of acne vulgaris. It should be used with caution in Indian skin as there are chances of post inflammatory hyperpigmentation and scarring. Acne vulgaris is the most common disease of the skin. It is a very common condition affecting adolescents and young adults., It usually causes significant psychological distress and reduced self-esteem of these young patients., It is a chronic inflammatory disease affecting the pilosebaceous unit. There is increased secretion of sebum and abnormal desquamation of the follicular epithelium which leads to obstruction of the pilosebaceous unit and comedo formation. The presence of sebum in the pilosebaceous unit attracts Propionibacterium acnes and plays an important role in mediating follicular inflammation., The existing oral and topical anti-acne medications are limited by efficacy, adverse effects, and patient compliance. The combination of antibiotic resistance, adverse effects of topical and systemic anti-acne medications, and desire for high-tech approaches has all led to new enthusiasm for light-based acne treatment.,,,,,,,,,,, Intense pulsed light (IPL) therapy has three therapeutic roles in acne vulgaris namely photochemical, photothermal, and photo-immunological. Basic principle of this therapy is more or less selective thermal damage of P. acnes . P. acnes synthesizes and stores large amount of porphyrins.,,,,,,,,,, Once the porphyrin is exposed to visible light, it becomes chemically active and transfers to an exited state, resulting in the formation of singlet oxygen, which combines with the cell membrane to destroy P. acnes. , We have used IPL as a monotherapy in our study and compared the two types of fluence: One is normal and other is subnormal fluence. The purpose of this study was to investigate the efficacy of IPL therapy in Indian skin. A total of 45 patients who satisfied the inclusion criteria and those who had given written informed consent from patients and/or guardians were chosen for the study. The inclusion criteria included age between 16 and 28 years and cases with inflammatory facial acne vulgaris. The exclusion criteria were tendency to form keloid and hypertrophic scar, history of photosensitivity, seizures, pregnancy, breastfeeding, tanned skin, history of treatment with systemic and topical antibiotics for acne vulgaris within the last 1 month and oral isotretinoin within the last 6 months of the study. For each patient, Fitzpatrick skin type, duration of the disease, prior treatment, and medical history were noted. The acne vulgaris was graded according to acne global severity scale which is approved by the US Food and Drug Administration. In addition, numbers of lesions were counted separately on both sides of the face by inspection and by taking photographs at each sitting and follow-up. Patients were advised to remove the entire makeup and wash face with soap and water before every sitting. All the safety measures were followed during the treatment. All the patients were given four sittings of IPL at 2 weeks interval and were followed up for 2 months every 2 weeks. Parameters used were wavelength (cut off filter) – 550 nm to 1200 nm, spot size – 40 mm 2 × 8 mm 2, pulse duration – 5 ms (two pulses), pulse interval – 10 ms, and fluence – right side - 35 J/cm 2 and left side - 20 J/cm 2. The fluence was reduced by 20% on forehead and bony prominences so as to avoid postinflammatory hyperpigmentation and scarring. After each sitting and at each follow-up, the side effects were noted. The immediate side effects such as erythema, burning sensation, edema, pain and delayed side effects such as hyperpigmentation, hypopigmentation, milia, blister and scarring were looked for. 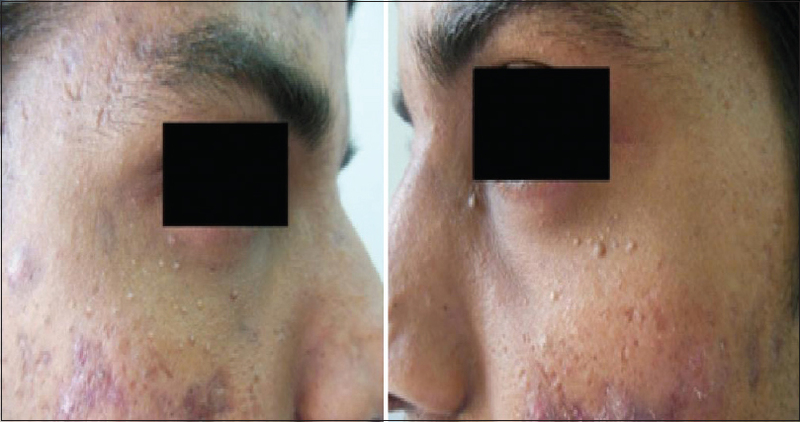 Appearance of new lesions during treatment was also noted on both sides of the face. The percentage reduction in the number of lesions was calculated at each sitting and follow-up and was graded as mild (0–25%), moderate (26–50%), good (51–75%), and excellent (76–100%). A total of 45 patients, 29 females and 16 males, with mean age of 21.15 ± 2.36 (range 16–28) years with diagnosis of acne vulgaris were enrolled in the study. All the patients had completed four sittings of IPL and 2 months of complete follow-up. Fitzpatrick skin type of the patients were as follows: 21 (46.7%) patients were Grade IV and the remaining 24 (53.3%) patients were Grade V. Of the 45 patients, 27 patients (60%) had acne Grade II lesions and 15 patients (33.3%) had acne Grade III lesions. Only 3 patients (6.7%) had acne Grade IV lesions. On both sides of the face, both fluences showed reduction in lesion counts and statistical analysis was carried out using Mann–Whitney U-test and Wilcoxon signed-rank test. P < 0.05 was considered statistically significant. There was no statistical significant difference noted in the efficacy of the two fluences used on the right and left sides of the face in reducing the number of acne lesion counts when compared at the end of the first, second, third, and fourth sittings [Table 1]. There was no statistically significant difference noted in the efficacy of the two fluences used on the right and left side of the face in reducing the number of acne lesion counts when compared at the end of each follow-up [Table 2]. Lesion count was reduced by 45.11% on the right side and by 41.98% on the left side at the first follow-up. The lesions at the second follow-up were reduced by 51.79% on the right side and by 46.97% on the left side [Figure 1], [Figure 2], [Figure 3]. At the third follow-up, the lesion count decreased by 57.17% on the right side and by 51.9% on the left side. At the time of the fourth follow-up, lesion count decreased by 63.49% on the right side and 57.9% on the left side. A statistically significant difference was noted in the reduction of acne lesion counts on the right and left side using two different fluences when baseline counts were compared with the first and fourth follow-ups [Table 3]. Percent reduction in the number of acne lesions at the final follow-up was compared with baseline lesion count and was graded as mild (0–25%), moderate (26–50%), good (51–75%), and excellent (76–100%). On the right side, reduction of acne lesion was moderate in 13 patients, good in 22 patients, and excellent in 10 patients. On the left side, reduction of acne lesion was mild in 2 patients, moderate in 16 patients, good in 19 patients, and excellent in 7 patients. Only one patient showed increase in lesion count on the left side [Table 4]. Other side effects such as hyperpigmentation, scarring, blister, and pain were not reported in any of the patients [Table 5]. Despite many advances in the treatment of acne vulgaris, the best option is still controversial. There are several conventional medical treatments for acne, but they have limitations such as poor efficacy (topical antibiotics), recurrence (topical antibiotics), high cost (systemic isotretinoin), and adverse drug reactions such as irritation (topical retinoid), bacterial resistance (systemic antibiotic), and teratogenicity (systemic isotretinoin). There is obvious need for new, safe, and effective modalities in acne treatment. IPL can be utilized either as monotherapy or as an adjuvant treatment to medical therapies. It is a good alternative when topical or systemic medicines are contraindicated or not tolerated. It can be considered in those patients in whom isotretinoin is contraindicated or not tolerated. As Indian patients have dark skin type, there are more chances of scarring and hyperpigmentation,, and that is why we have used two types of fluence in our study – one is normal and other is subnormal fluence. None of our patients shows hyperpigmentation and scarring. Itching was most commonly complained side effect which was mild in nature. Only two patients required the use of antihistamine, and rest of the patients did not require any form of medication [Figure 4]. This side effect was not reported in any of the other studies using this therapy. Two patients (4.4%) developed erythema and three patients (6.7%) complained of burning sensation. Two patients (4.4%) developed milia. High fluence used in our study had more photothermal and photochemical actions whereas subnormal fluence had more photochemical and photo-immunological actions.,,, Proven efficacy, minimal to no systemic side effects, and convenience of an outpatient basis procedure make this therapy an exciting option for patients with acne vulgaris. There are some studies which evaluated the different parameters such as wavelength, pulse duration and single and burst pulse mode in the treatment of acne for achieving the best result. However, to the best of our knowledge, there are no studies to compare two different types of fluence on both sides of face, especially in Indian skin. Hence, from the results, it is proven that subnormal fluence is as effective and efficacious as normal fluence used on other side of the face in Indian skin with no serious side effects. Our results suggest that it is effective and safe option for inflammatory acne vulgaris with minimal downtime and reversible side effects. Although the study was done using it as monotherapy, we recommend combination of systemic antibiotics along with it for better and long-lasting results. Yeung CK, Teo LH, Xiang LH, Chan HH. A community-based epidemiological study of acne vulgaris in Hong Kong adolescents. Acta Derm Venereol 2002;82:104-7. Leyden JJ. Therapy for acne vulgaris. N Engl J Med 1997;336:1156-62. Gupta MA, Gupta AK. Depression and suicidal ideation in dermatology patients with acne, alopecia areata, atopic dermatitis and psoriasis. Br J Dermatol 1998;139:846-50. Cotterill JA, Cunliffe WJ. Suicide in dermatological patients. Br J Dermatol 1997;137:246-50. Elman M, Lask G. The role of pulsed light and heat energy (LHE) in acne clearance. J Cosmet Laser Ther 2004;6:91-5. Layton AM. Disorders of sebaceous glands. In: Burns T, Breathnach S, Cox N, Griffiths C, editors. Rooks Textbook of Dermatology. 8th ed., Vol. II. Oxford, UK: Wiley-blackwell, A John Wiley and Sons Ltd. Publication; 2010. p. 42.1. Holland KT, Aldana O, Bojar RA. IPL in acne vulgaris. Lasers Surg Med 1998;196:67-8. Kjeldstad B. Different photoinactivation mechanisms in Propionibacterium acnes for near-ultraviolet and visible light. Photochem Photobiol 1987;46:363-6. Yeung CK, Shek SY, Bjerring P, Yu CS, Kono T, Chan HH. A comparative study of intense pulsed light alone and its combination with photodynamic therapy for the treatment of facial acne in Asian skin. Lasers Surg Med 2007;39:1-6. 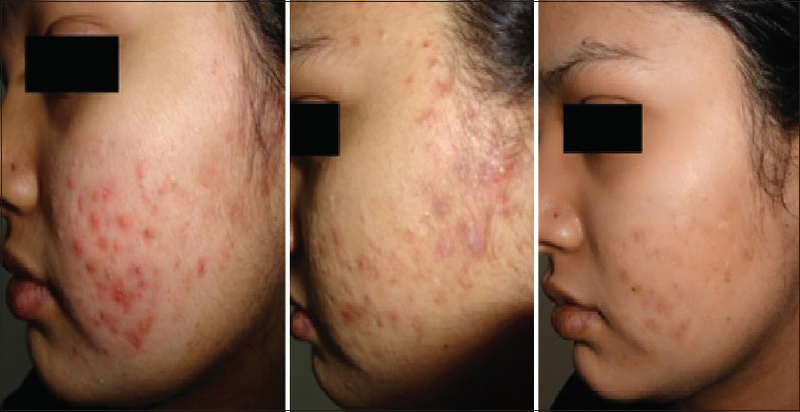 Mohanan S, Parveen B, Annie Malathy P, Gomathi N. Use of intense pulse light for acne vulgaris in Indian skin – A case series. Int J Dermatol 2012;51:473-6. Fernandes NF, Zeichner JA. Laser and light based treatments for acne vulgaris. Cosmet Dermatol 2010;23:356-63. Rai R, Natarajan K. Laser and light based treatments of acne. Indian J Dermatol Venereol Leprol 2013;79:300-9. Babilas P. Light assisted therapy in dermatology – The use of IPL. Med Laser Appl 2010;25:61-9. Babilas P, Schreml S, Szeimies RM, Landthaler M. Intense pulsed light (IPL): A review. Lasers Surg Med 2010;42:93-104. Babilas P. Use of intense pulse light sources in dermatology. update 2012 Photonics and Lasers in Medicine 2012;1:15-25. Faghihi G, Isfahani AK, Hosseini SM, Radan MR. Efficacy of intense pulsed light combined with topical erythromycin solution 2% versus topical erythromycin solution 2% alone in the treatment of persistent facial erythematous acne macules. Adv Biomed Res 2012;1:70. Choi YS, Suh HS, Yoon MY, Min SU, Lee DH, Suh DH. 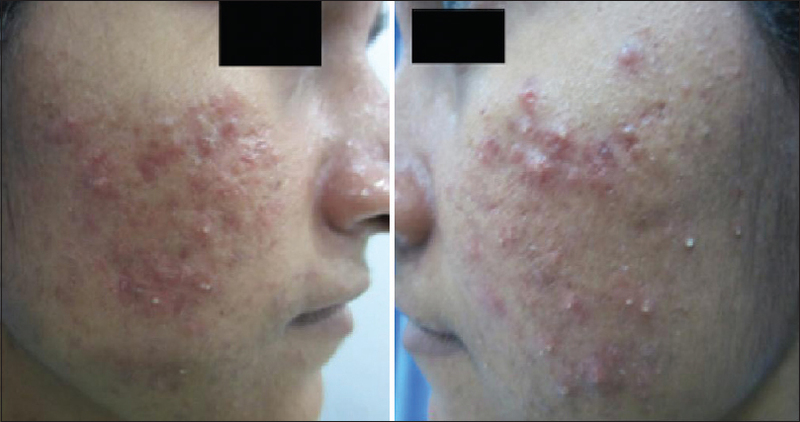 Intense pulsed light vs. pulsed-dye laser in the treatment of facial acne: A randomized split-face trial. J Eur Acad Dermatol Venereol 2010;24:773-80. Seaton E. Investigation of mechanism of action of nonablative pulsed dye laser therapy in photorejuvenation and inflammatory acne vulgaris. J Eur Acad Dermatol Venereol 2009;16:523-9. Schoenewolf NL, Barysch MJ, Dummer R. Intense pulsed light. Curr Probl Dermatol 2011;42:166-72. Gold MH, Bradshaw VL, Boring MM, Bridges TM, Biron JA, Carter LN. The use of a novel intense pulsed light and heat source and ALA-PDT in the treatment of moderate to severe inflammatory acne vulgaris. J Drugs Dermatol 2004;3 6 Suppl: S15-9. Santos MA, Belo VG, Santos G. Effectiveness of photodynamic therapy with topical 5-aminolevulinic acid and intense pulsed light versus intense pulsed light alone in the treatment of acne vulgaris: Comparative study. Dermatol Surg 2005;31 (8 Pt 1):910-5. Rojanamatin J, Choawawanich P. Treatment of inflammatory facial acne vulgaris with intense pulsed light and short contact of topical 5-aminolevulinic acid: A pilot study. Dermatol Surg 2006;32:991-6. Chang SE, Ahn SJ, Rhee DY, Choi JH, Moon KC, Suh HS, et al. 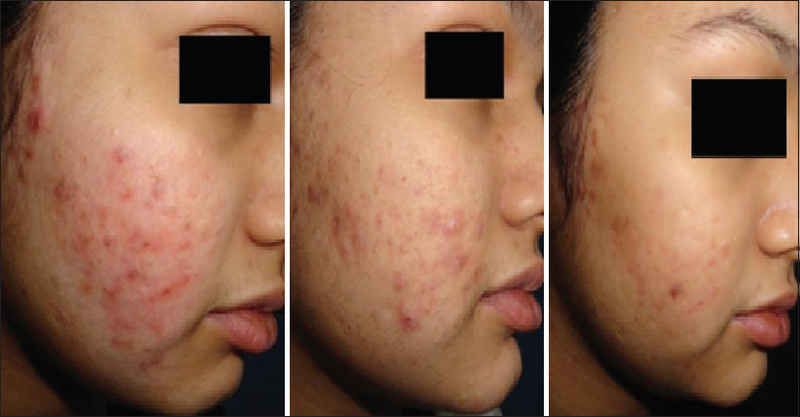 Treatment of facial acne papules and pustules in Korean patients using an intense pulsed light device equipped with a 530- to 750-nm filter. Dermatol Surg 2007;33:676-9. Taub AF. A comparison of intense pulsed light, combination radiofrequency and intense pulsed light, and blue light in photodynamic therapy for acne vulgaris. J Drugs Dermatol 2007;6:1010-6. Sami NA, Attia AT, Badawi AM. Phototherapy in the treatment of acne vulgaris. J Drugs Dermatol 2008;7:627-32. Jiang LI. Clinical study and evaluation of treatment of face acne vulgaris with intense pulsed light. Chin J Dermatol Venerol Integr West Med 2009;8:6. Kumaresan M, Srinivas CR. Efficacy of IPL in treatment of acne vulgaris: Comparison of single- and burst-pulse mode in IPL. Indian J Dermatol 2011;55:370-2. Kawana S, Tachihara R, Kato T, Omi T. Effect of smooth pulsed light at 400 to 700 and 870 to 1,200 nm for acne vulgaris in Asian skin. Dermatol Surg 2010;36:52-7. Kumaresan M, Srinivas CR. Efficacy of IPL in treatment of acne vulgaris: Comparison of single- and burst-pulse mode in IPL. Indian J Dermatol 2010;55:370-2. Melø TB. Uptake of protoporphyrin and violet light photodestruction of Propionibacterium acnes . Z Naturforsch C 1987;42:123-8. Elman M, Lebzelter J. Light therapy in the treatment of acne vulgaris. Dermatol Surg 2004;30 (2 Pt 1):139-46. Young S, Bolton P, Dyson M, Harvey W, Diamantopoulos C. Macrophage responsiveness to light therapy. Lasers Surg Med 1989;9:497-505. Intense pulse light can be used safely in Indian skin. At subnormal fluence it is equally effective in acne vulgaris in Indian skin without any side effects.